We regret to inform you that the death has taken place of Mark Hamilton peacefully at Altnagelvin Hospital on 5th November 2018, may he rest in peace . Late of 77 Slievemore Park , Derry . Dear Son of the late Norah and George R.I.P. Loving father to Nicole , Carla and Lauren. Dear brother of Myra , Georgina , Norah , Margaret , Ellen , Angela , Marie , Paul , Christopher , Stephen and Brian . Much loved grandfather to Jackson and Joey. Reposing from his late residence, funeral will leave from there on Wednesday 7th November at 09.45am for requiem mass at 10.30am in St Joseph’s Church , Galliagh , Derry. 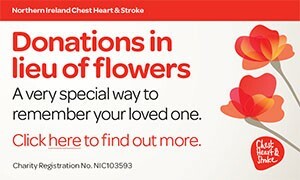 Family flowers only and donations if desired in lieu to Foyle Hospice. Deeply regretted by Paulette, his daughters, sisters and brothers , grandchildren , sisters and brothers in law and the entire family circle . Padre Pio pray for him . I am sorry to tell you that Mark Hamilton has passed away.